You can set up Mozilla Thunderbird to let you start replies above quoted text. It is your reply after all, not mere footnotes you add. Mozilla Thunderbird still insists on placing the cursor below quoted text when you start a reply or, a bit inexplicably, quotes the original message's text and then highlights it all as if to suggest you immediately press Del? Fortunately, Mozilla Thunderbird is not stubborn about either. Instead of moving the cursor up every time, you can change Mozilla Thunderbird's mind just once—for all future replies to start right at the top, above all quoted text by default. Select Tools | Account Settings… (Windows, Mac) or Edit | Account Settings… (Linux) from the menu in Mozilla Thunderbird. Hold down the Alt key if you cannot see the menu bar. You can also select Options | Accounts Settings… (Windows) or Preferences | Account Settings… (Linux, Mac) from the menu button's menu. Go to the Composition & Addressing category for the desired email account. Make sure Automatically quote the original message when replying is checked under Composition. Now choose start my reply above the quote next to Then,. For lazy top-post quoting, you may also want to choose below my reply (above the quote) following and place my signature. What Will the Other Reply Options Do in Mozilla Thunderbird? If you do not place your reply and signature on top, what options are there in Mozilla Thunderbird? start my reply below the quote: Mozilla Thunderbird will quote and indent the text of the message to which you reply; the first line of the reply will introduce the quoted text with "On <day>, <sender> wrote:"; the text cursor will be placed below the quoted message for you to start typing, above your signature if any is inserted automatically. select the quote: Mozilla Thunderbird will quote the original message in your reply; the first line will introduce the original text as a quotation; your signature (if you have set up one to be automatically included) will be inserted below the quoted text, after some space for your reply; all text (not just the quoted text) will be highlighted. 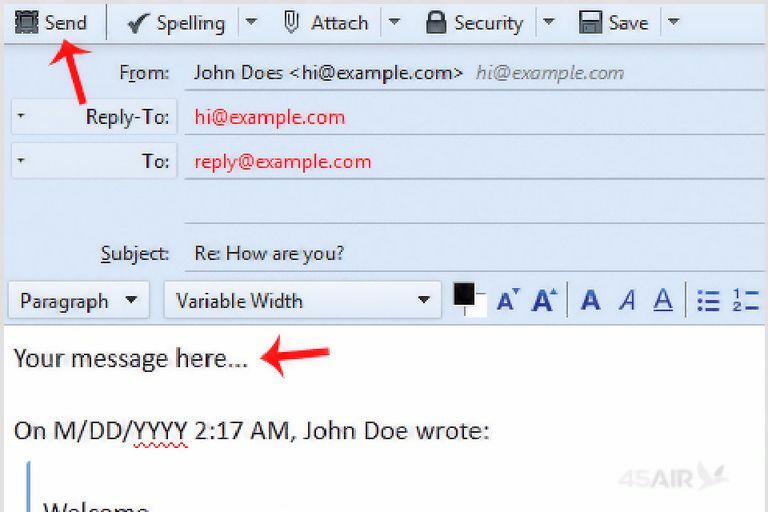 Include signature for replies: Mozilla Thunderbird will automatically insert your email signature (otherwise used for new messages) in replies. below the quote (recommended) under and place my signature: Mozilla Thunderbird will leave space for your reply above quoted text and have the text cursor positioned there automatically; your email signature will be put below all content quoted from the original message, however, with space between the quote and the signature. We do not recommend this setting.